Elite Management model Amna Bazergan takes on film for our cover shoot in Cabbagetown, Toronto. As the evening darkened and the wind softly howled outside, our team of talented artists got together and made magic within the walls of an old victorian home in Toronto’s historic Cabbagetown, a unique suburb dating back to the 1840s. Known for her appreciation of art and a love for ballet, photographer Karolina Kuras delicately hand painted backdrops for our cover shoot’s stunning set. Curated by Ashley Readings and styled by “& for love”, the looks drew inspiration from an elegantly dark depression like era and almost ghost like appeal. 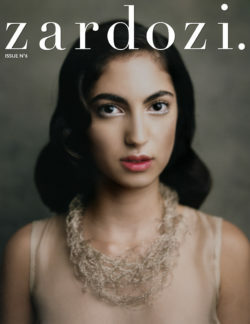 Our cover focuses on the beauty and elegance of a bygone era. Embrace the elegance in The Beautiful and the Damned. With a nostalgic pride sense of pride for shooting on film, we captured all images with the Linhof. One of the oldest still-producing camera manufacturers in the world, Linhof dates back to 1887.